ocated near the Canadian border, Mount Baker and the San Juan Islands, Bellingham is featured as one of the top clean and green cities in the U.S.An alive place to visit or live, magazines like AARP, Money and Outside have publicized this growing city. 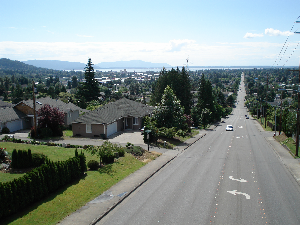 The Whatcom County population stands at around 180,000 and ispredicted to rise to 212,000 by 2010. Bellingham offers an assortment of shops, art galleries, theatre and venues for the performing arts. Also golf courses and interesting places to hike or bike. Motels, hotels and B&B’s often include a pool, hot tub and sauna, fitness room, restaurant and lounge. Prices in moderate range run from $60 – $100. Larrabee Park is situated on 2,683 acres with both salt water bays and fresh water lakes, hiking trails and campgrounds. Other parks also appeal to outdoor lovers. Scuba divers and kayakers have an abundance of bays and inlets to check out. May through September whale watching is popular. Several pods of Orca whales frequent the area, delighting charter boat passengers. Close by, Fairhaven’s historical charm, Lynden’s Dutch heritage, Ferndale’s rural beauty and Blaine at the Canadian border are good mini getaways. 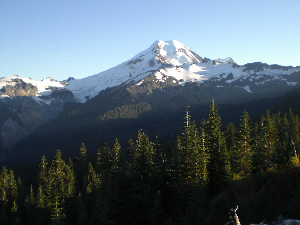 At 10,000 feet Mount Baker provides incredible views and unrivaled sports opportunities. The mountain holds the world’s record for the most annual snowfall. Result: a paradise for skiers, snowboarders and hikers.